Do you love the classic pairing of creamy blue cheese with zesty buffalo sauce? 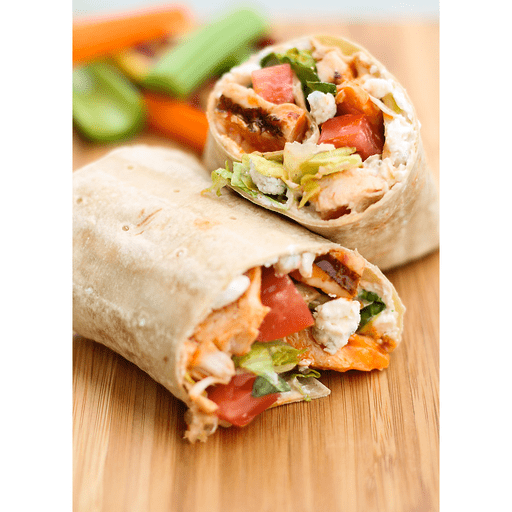 Try our lightened up Buffalo Chicken Wrap! Stuffed with protein-rich chicken, fresh veggies and a simple homemade blue cheese dressing, this is one scrumptious meal-in-a-wrap. 1. In a small bowl, whisk together Greek yogurt, blue cheese crumbles, onion powder and garlic powder until well mixed. Divide dressing and spread evenly onto one side of each tortilla. 1. Add chicken and buffalo sauce to a medium bowl and toss to coat. Divide chicken and add to tortillas. Top each wrap with romaine lettuce and diced tomatoes. Roll up and serve. For gluten free: Use gluten free tortillas instead of whole wheat. Calories 310, Total Fat 7g (Saturated 1.5g, Trans 0g), Cholesterol 75mg, Sodium 810mg, Total Carbohydrate 27g (Dietary Fiber 7g, Sugars 4g), Protein 39g, Vitamin A 50%, Vitamin C 6%, Calcium 8%, Iron 15% *Nutritional values are an approximation. Actual nutritional values may vary due to preparation techniques, variations related to suppliers, regional and seasonal differences, or rounding.